Are you ready for this? I've been slaving away in the kitchen all the weekend so I could bring you this amazing meal. Hah! I lie. I've actually been lazing around watching TV while I let all my kitchen appliances do the work for me. 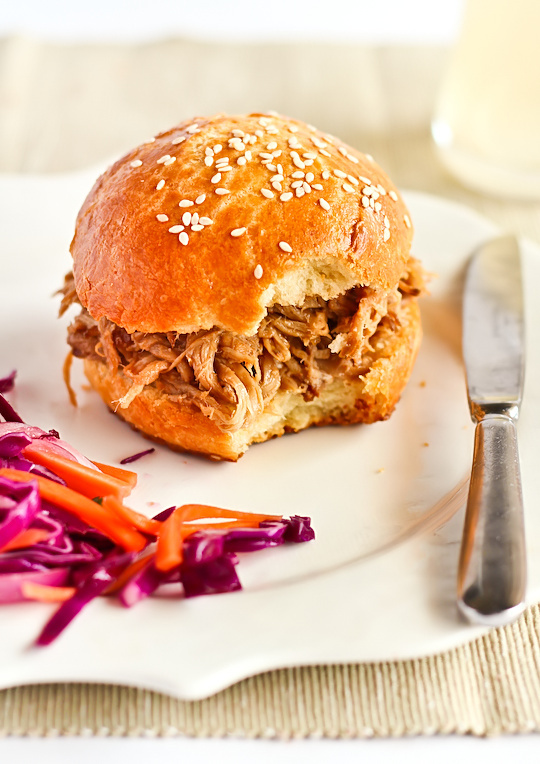 I'm in love with my slow cooker and the dough hook attachment on my stand mixer because it means I get to eat 10-hour slow cooked Ginger Beer Pulled Pork on buttery Brioche Buns and served with a spicy, colourful coleslaw. I love my kitchen appliances. The ginger beer isn't particularly strong so you can't really distinguish its flavour in the pork or the sauce, but it adds a lovely sweetness and a little kick. If you wanted to up the ginger flavour you could probably add a small piece of fresh ginger into the cooking liquid or add some ground ginger to the spice rub. When you eat this pulled pork mixed up with the sauce on top of buttery, eggy, slightly sweet and freshly baked brioche buns you end up with flavour perfection. There's such a great balance of sweet, salty, spicy and sour. I used my usual recipe for brioche that I've blogged about previously. Even though I kept putting off this recipe idea because I kept thinking that the brioche was painfully complicated, I was surprised to find that the recipe was very straightforward; there's just a lot of waiting time while you while the dough is proving. It's definitely worth the wait, the end result are these pillow-soft, rich and buttery rolls that are perfect for eating with the pork. Or with burgers. Or shaped into hotdog buns. Or eaten with strawberry jam. Or kaya and salted butter! It's good with everything and it's good on its own. 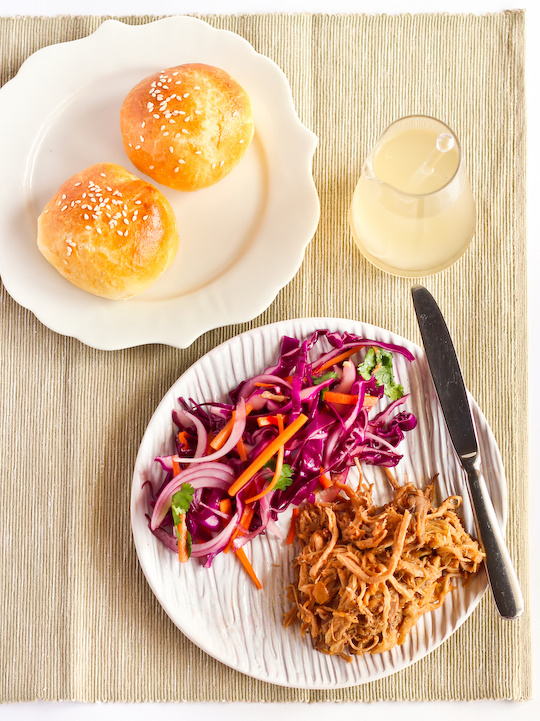 I served these pulled pork buns with a Vietnamese-inspired red cabbage coleslaw with pickled carrots, red onion and coriander and a fish sauce, vinegar, lime and chilli dressing. I love the bright purple colour of this salad and the light dressing that's packed full of flavour. These days I love to make this coleslaw recipe as an alternative to the heavier, creamy mayo coleslaws. And can you believe it, two savoury recipes in the space of one month after a year of no savoury recipes! I need figure out where I left my sweet tooth. While I'm doing that, find some free time to make this recipe. I know the ingredients list looks long but you can adapt the pork depending on what you have available - try it with dijon instead of wholegrain mustard, or cook it in ginger beer and add whatever sauce to the pork later if you're feeling lazy. Mix the yeast, 1 teaspoon of sugar and the milk in a small bowl. Set aside for 10 minutes until frothy. Combine the flour, remaining sugar and salt in a large bowl. 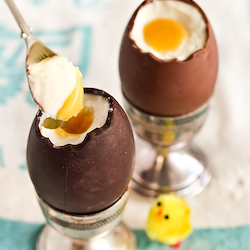 Make a well in the centre and pour the eggs, milk and yeast mixture. Punch the risen dough down, turn out onto a lightly floured work surface and knead for 2-3 minutes. Return to the bowl and place in the refrigerator for several hours or overnight. Split dough into 12 equal portions for regular sized buns, 24 portions for miniature buns (I did half-half). Roll into neat balls and flatten slightly. Place on two baking paper lined baking trays, equally spaced apart. Cover and leave for an hour at room temperature. Preheat the oven to 220°C (428°F). 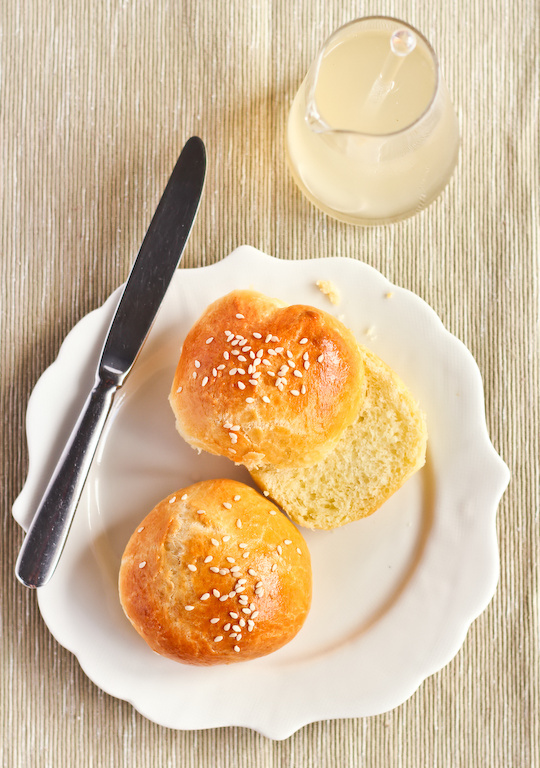 Lightly glaze the buns with egg wash and sprinkle a pinch of sesame seeds on top of each. Bake for 10 minutes, then reduce temperature to 190°C (375°F) and bake for another 10 mins (only 5 mins for the mini buns) or until golden brown on top and a skewer inserted into the centre comes out clean. I baked one tray at a time in my small oven, but if you're baking two trays you will want to switch the top and bottom tray around halfway through. Remove the brioche from the tray immediately and let cool on a rack. goodness this looks A-Mazing! 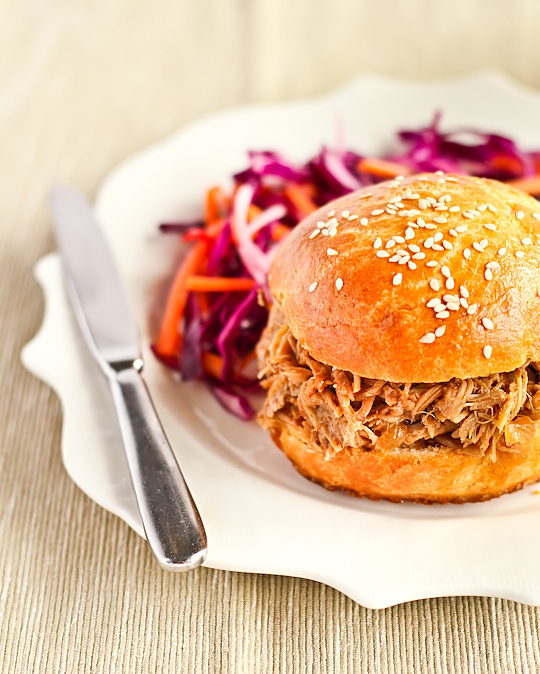 Can't wait to try the pulled pork - I've never done it myself and it seems so easy! Your photos are so delectable I should remind myself to read your blog when I've got a full stomach so it doesn't start grumbling! 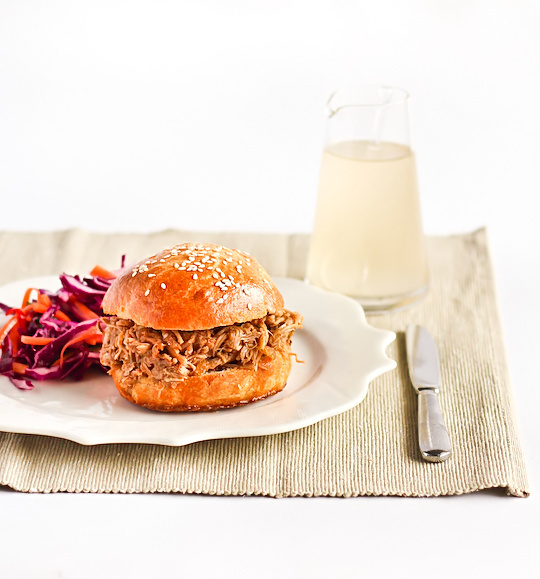 Love the idea of cooking pork with ginger beer. Looks great! Oh, this is so so beautiful. 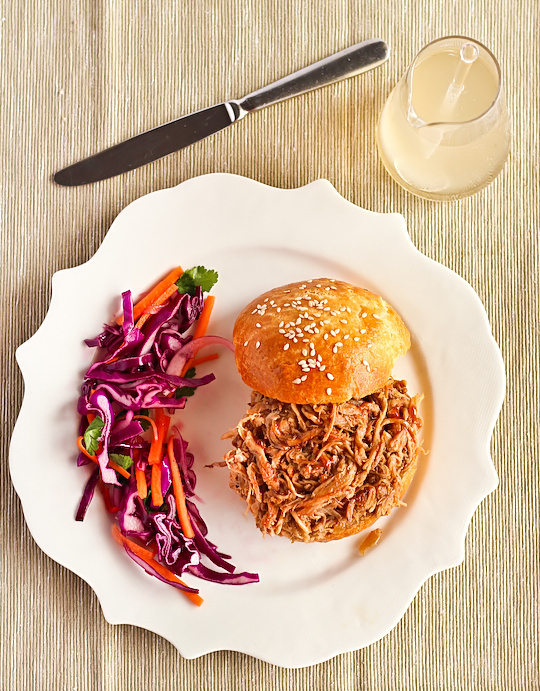 I absolutely love pulled pork and we make a sweet bbq sauce from scratch at home. Love the idea of ginger beer with it! 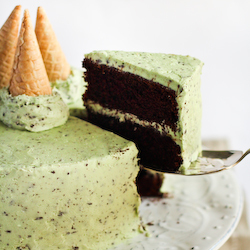 Oh mah gawd, I want some of that now!!! so beautiful I want to cry! Can't fault the recipe either nice one Steph! 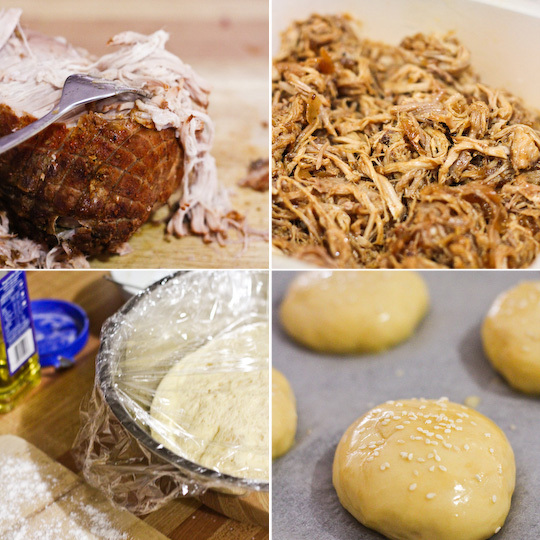 I've come across 3 pulled pork recipes this week and all are eaten with delicious and soft looking buns! 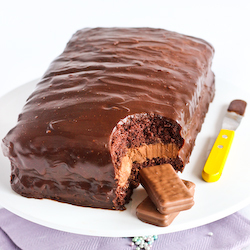 Yours look like a real treat!! I love pulled pork sandwiches! Oh how I would love to try them on the brioche buns! Your scones look fabulous too~stunning photos! This looks perfect. Have to try this! Sounds spicy. The pork is enticing, it's giving me a hard crave for that kind of sandwich. This looks awesome!! I've been looking for a recipe for brioche buns for a while now. Can't wait to try these. Thanks for posting!! apple cider and ginger beer - two very underestimated marinades! these look super fantastique. mmm. And I can't help but be a bit distracted, but where did you get those ornate-edged plates from? They look so pretty, I want some! AMAZING!!! love the flavours youve got going on in there too. your savoury recipes are really good too, i hope you have more of them coming in the future hehe. I made your pork and the salad. A lovely combination. Utterly delicious. Not hard to follow and all of my guests loved it. Alas, I didn't make the buns as I don't have a bread hook here. But I will. Splendid. And your site is beautifully done. Thanks. Yum! 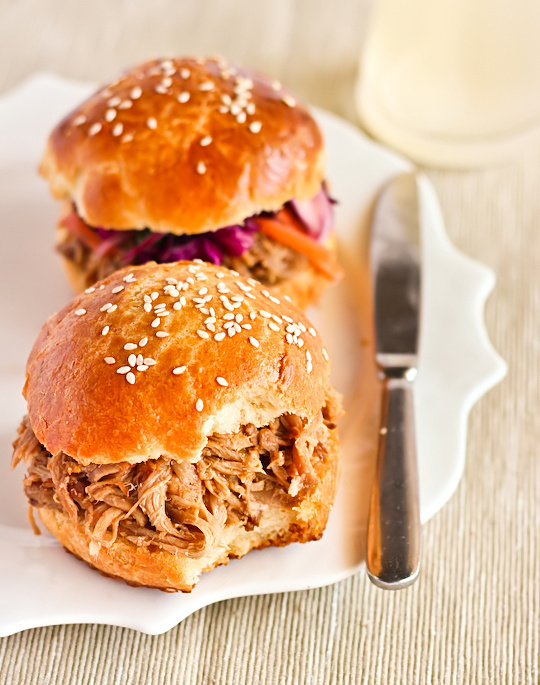 I love pulled pork and brioche. Never thought to pair them! Incredible! This is gonna be on my plate for dinner! Hello Steph! I've been reading your blog for a while and love it, though this is the first thing I've been brave enough to try! I just wanted to say that I made this in my oven (I don't have a slow cooker/crock pot) and it took about 5 - 5 1/2 hours at 150C. Yum! Phuoc'n Delicious - Can't disagree! Thanks Phuoc! jas - the gluten free scallywag - Thank you dear! You should definitely try it :D Haha I always have that problem when reading food blogs! leaf (the indolent cook) - it had to be done! thanks! Yasmeen - Yummm, homemade BBQ sauce is the bomb. I bet your sauce would go great with this! K | Citrus and Candy - Wish you could have!! Lex - Yay it gets the Chef Lex tick of approval? woot! Lisa - it's all your fault Lisa. All your fault! Sue - I love pulled pork anything :D Aww thank you! Kelvin Wu - Yay hope you do! myfudo - err not really, tbh there's hardly any spice at all. 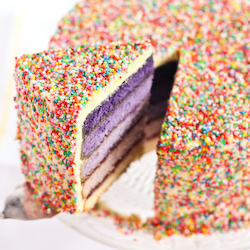 Anonymous - Hope you like the recipe! Cassandra @foodmyfriend - Interesting, didn't know they sold it there! Martha McPhee - YAY! These are my favourite type of comments. So glad to hear it went down well! Hannah@ Bake Five - :) Thank you! I just made this today.. You are a genius! It turned out perfectly, meat was so tender, buns so soft and pillow-y.. I'm in Food heaven. Do you think beef would be good in this recipe? Sure! Though you might want to consider replacing the ginger beer with cola instead! We made the pulled pork for dinner today! It was LOVELY! The house smelled amazing and we very much enjoyed it with some homemade challah bread. Thank you for sharing!